Retail.Global – Blockchain Business-as-a-Service Ecommerce Ecosystem, powering global sales for retailers and manufacturers with a complete white label online store solution. Start global sales of brand products easily don’t need infrastructure with all-in-one interface: customize shop, turn delivery and payment on, connect warehouses, fulfillment, marketing, support and loyalty token system. 3 internal marketplaces for services, service providers and products suppliers make it possible to operate globally and get revenue from different markets. Currently in Retail.Global: 10 years e-commerce experience team, platform and infrastructure, 10 enterprise clients, $4mln revenue/year and ready-to-scale platform. Our mission is to bring innovation to retail and create an awesome customer shopping experience: new technologies powered by blockchain with global approach make it possible. Retail.Global makes products & service for B2B customers that make global sales easy: all barriers like languages, local delivery, returns, taxes, marketing, marketplaces, support and help of ecommerce experts – will be united in one product. 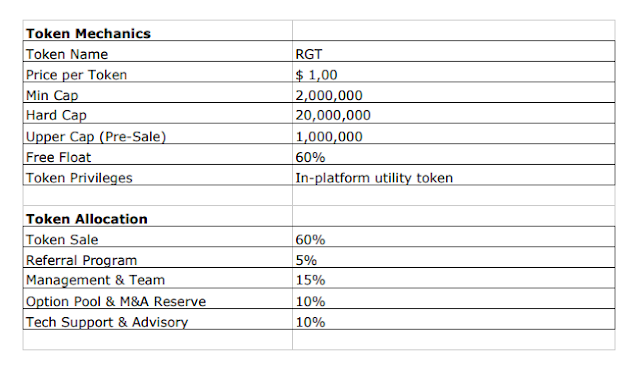 To work with the platform it is necessary to make a deposit in RGT in the amount of $ 10,000.